Sometimes a good picture can be jinxed by a campaign that refuses to jell --- then there are those left at the starting post as sales personnel devote themselves to more promising stock. 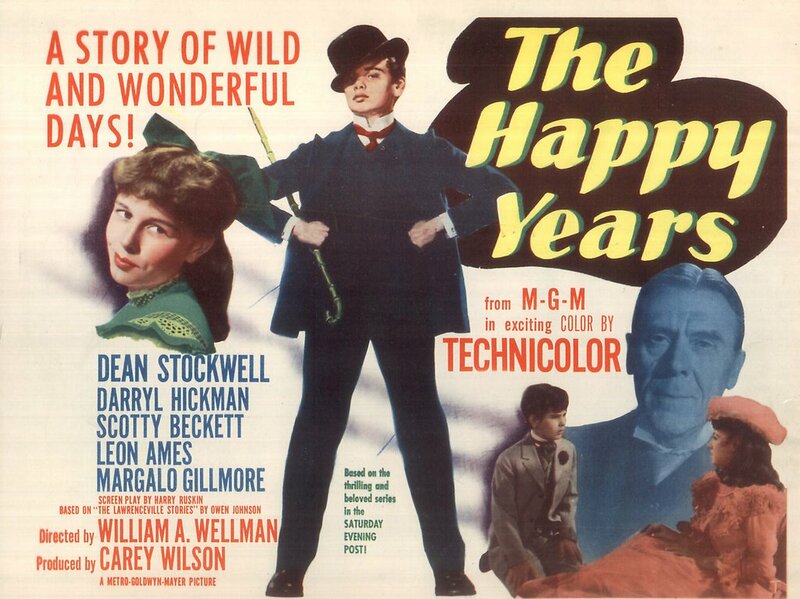 Everything fell apart for The Happy Years from the moment it was trade-shown on May 24, 1950. MGM had unveiled Annie Get Your Gun to showmen the day before, excitement building too for Father Of The Bride. These were leviathans that would roll over The Happy Years, and all these years later, it’s still on the canvas. We can only guess what went wrong, though trade scribes hinted at the problem. Ads covered with type and cluttered posters, said The Manager’s Round Table section of The Motion Picture Herald --- very little illustration, so you have to read to get the point. One-sheets were uninspired, as shown here, and limited to headshots of an unpresupposing cast. What exactly was Metro selling? No one seemed to get a handle on how to exploit The Happy Years. 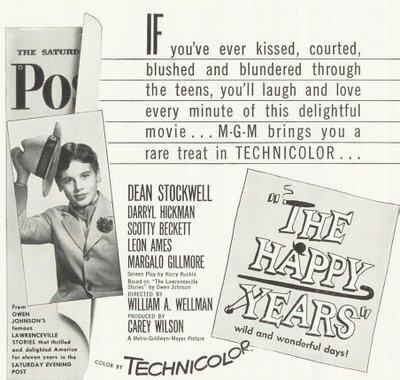 It was based on "beloved" stories that had run in The Saturday Evening Post over the last eleven years, but was Post reader familiarity enough to get back $1.3 million spent on this Technicolor period piece? Costumers were hard enough to merchandise with stars on board (witness The Tall Target), so how do you excite patrons over a boy’s prep school at the turn of the century? In the end, I suspect they just gave up. 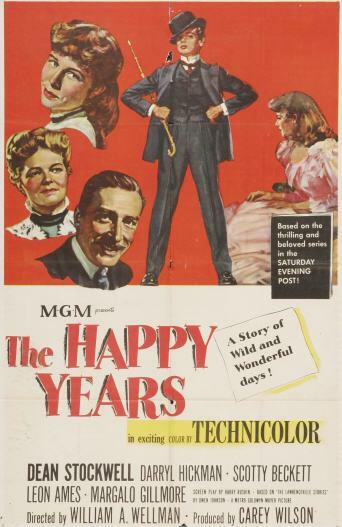 The Happy Years headed double bills with another MGM forfeit, Mystery Street (loss --- $277,000). This is a grand picture and deserved better results, said one manager concluding his dispirited run of The Happy Years. Worthy shows had been dumped before and would be again, but it was sad seeing this one swept under the carpet. As Annie Get Your Gun and Father Of The Bride racked up enormous grosses, The Happy Years withered in the heat of summer playoff and finished with an egregious $680,000 in domestic rentals, plus $179,000 foreign (again, that curse of Americana). 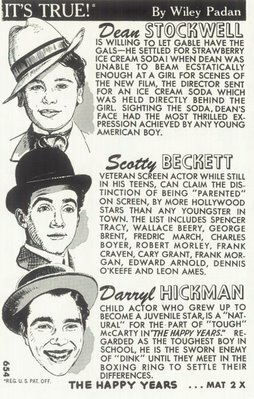 A million-dollar loss was recorded in Metro ledgers, and there would be no re-issues, other than a few bookings among the MGM Children’s Matinee series of the early seventies where it was re-titled The Adventures Of Young Dink Stover. 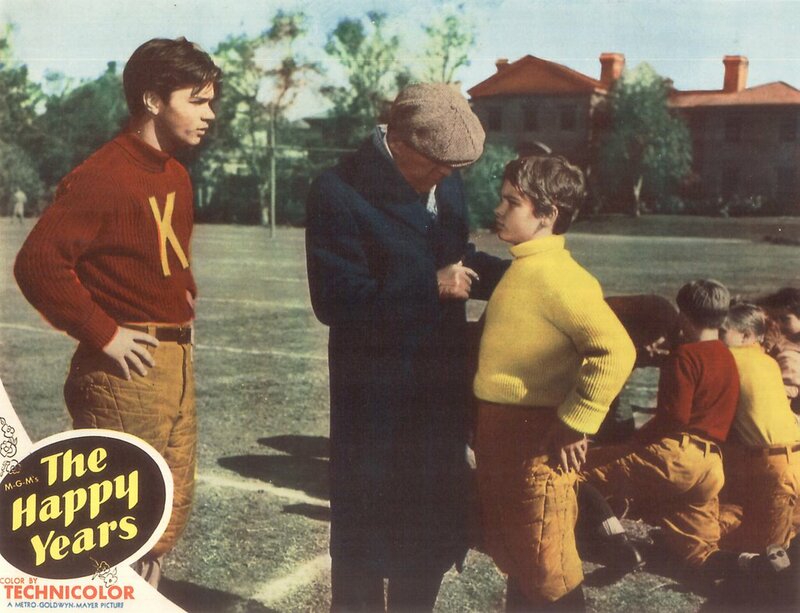 Those who cared might have seen The Happy Years previously on television, as it had gone into syndication for Fall 1964 with 39 other post-48 Metros. The (very) few prints in circulation among collectors were either heisted from Films, Inc. or some TV station. I’ve not yet met anyone who didn’t like this picture. Occasionally there are sightings on TCM, but otherwise The Happy Years is orphaned. There’s never been a video release. I’ve watched interviews with Dean Stockwell in hopes it would be mentioned, but he’d rather talk about the glories of having done Blue Velvet. My father went to a boy’s school very much like Lawrenceville, the setting of The Happy Years. He particularly enjoyed the picture when we saw it on the old SFM Holiday Network presentation around 1981, but is there anyone left who would understand, even remotely, the student’s life he identified with? This was truly a movie for men who’d come of age near the turn of the (past) century. No one born since could comprehend, nor dramatize, that world so well. Producer Carey Wilson, born 1889, was enamoured of the project, having been a faithful reader of the Lawrenceville stories. Chances are he attended a place very much like it. 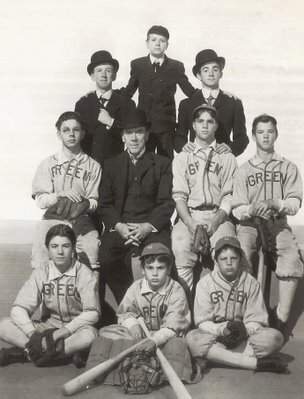 Director William Wellman had been an outstanding athlete in high school, though it’s been suggested he never finished. He was born in 1896. These men brought old-world sensibility to The Happy Years. Both were fascinated by the culture of a boy’s academy. I’ve not experienced a place such as Lawrenceville, but details seem authentic. I’d like to think my father’s sojourn at the McCallie School in Chattanooga, Tennessee was similar. He boarded there in the late teens. The night we watched The Happy Years, he surprised me when he turned and said at the end, "Now that was really good," a reaction no picture had gotten from him in my memory. Maybe his own experience in that universe of The Happy Years gave insight to its larger truths. 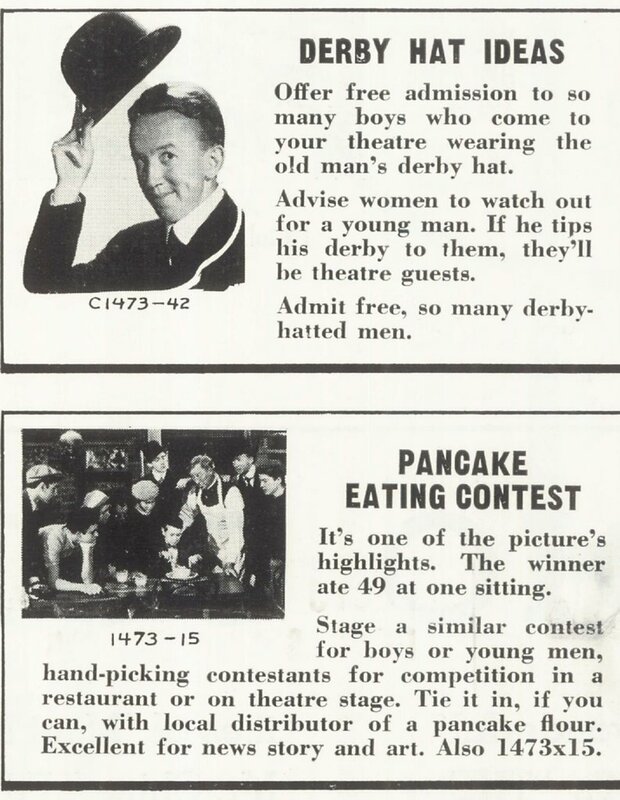 It took men of a certain age to appreciate crucial distinction between gerunds and gerundives. 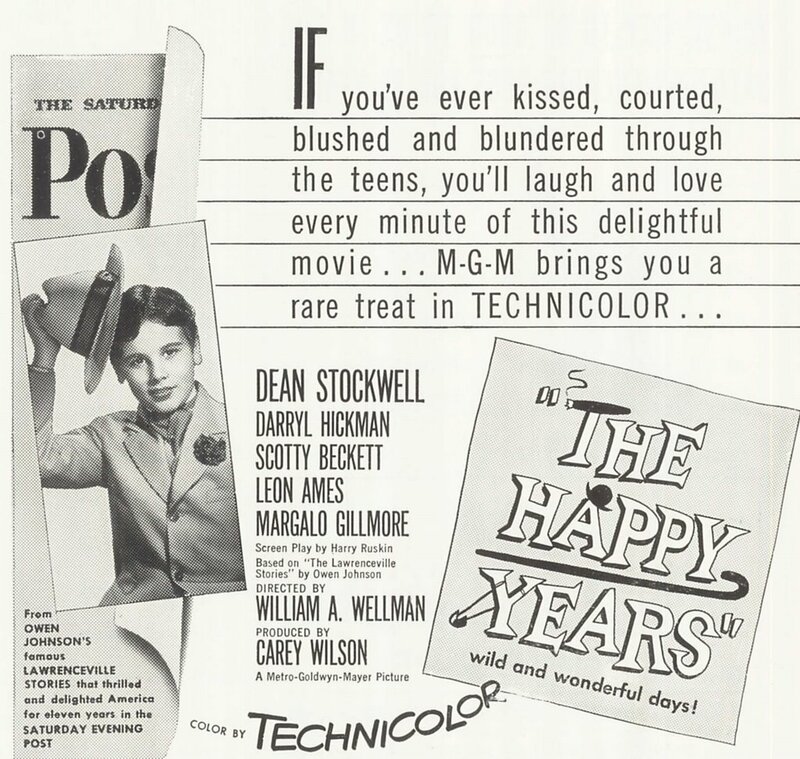 Youthful roles for Dean Stockwell, Darryl Hickman, and Scotty Beckett were nearly exhausted when they did The Happy Years. No longer boys in a cute sense, they were deep into adolescence and complications that implied. Scotty had been arrested the year before for driving drunk. By the time The Happy Years went into production, he was twenty years old and married. The easy charm he projects in the movie was something he had plenty of in real life. It got him (barely) out of tough scrapes over a tumultuous adulthood until his luck ran out with a probable suicide (his third attempt) in 1968. 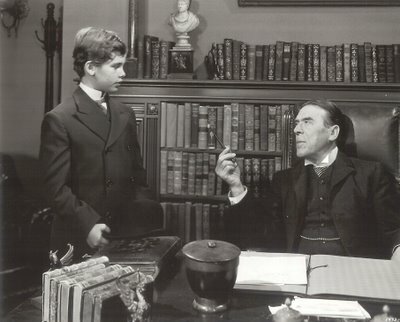 Dean Stockwell was younger --- thirteen at the time The Happy Years was shot. 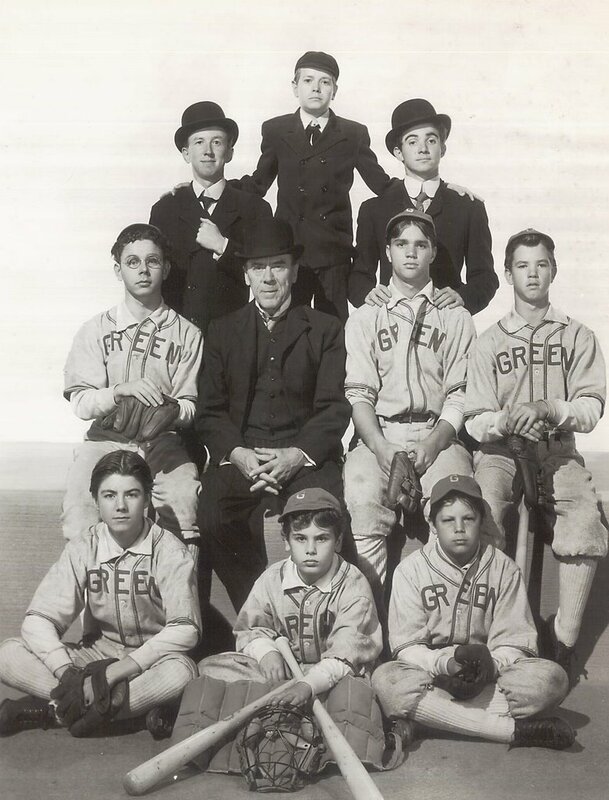 This was his peak period, but late in the post-war day for child players to enter the game. He had the distinction of appearing in two classics released within weeks of each other --- Stars In My Crown and The Happy Years, but kid pictures of the kind MGM routinely turned out during the thirties and forties were disappearing fast, and Stockwell would only have a couple left before withdrawing for several years to wait out puberty. 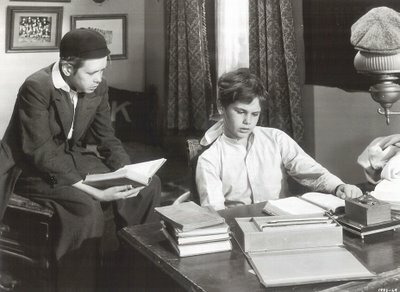 Darryl Hickman was gangly and well past boy parts at eighteen, but he’d been in movies since If I Were King in 1938. He was on a TCM child star panel and gave a good account of himself. I found it hard to believe someone so youthful in appearance and attitude could be seventy-five as of 2006. He has a book, and it has received praise. Also, there’s a website. Brother Dwayne’s in The Happy Years as well, though I’ve had no success spotting him. Neophyte Robert Wagner is recognizable, however. Variety suggested trims. The Happy Years was both leisurely and overlong. It is relaxed as to pacing, but wasn’t life itself laid back in waning days of the gay nineties? I’d not vote to remove a moment of those 110 minutes. Was life so idyllic in that final decade of the nineteenth century? MGM certainly implied it was. Patriarch of choice Leon Ames is on hand, his a comforting presence as is the familiar Meet Me In St. Louis house (even against a beach set matte painting). These help The Happy Years seem of a piece with the earlier musical and Metro period pieces gone before. 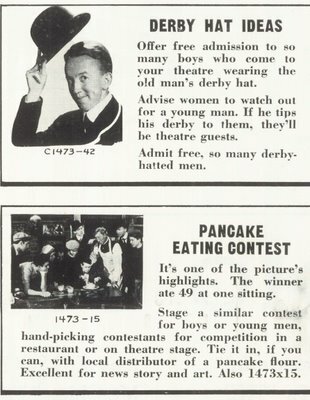 Red Skelton’s Excuse My Dust of the following year would utilize the same standing sets. Much of the furniture seen in The Happy Years would be used again here. 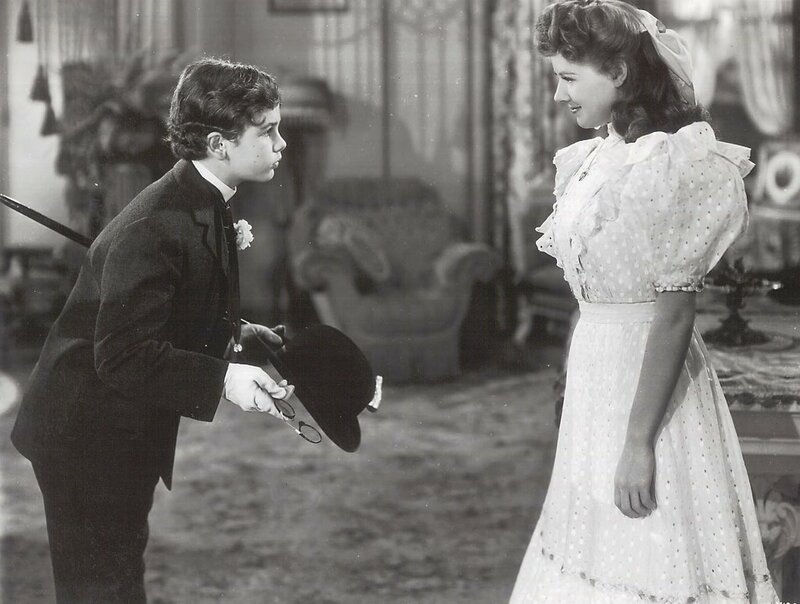 Celebration of times past would prevail at Fox with Cheaper By The Dozen, and Warner’s Booth Tarkington stories accommodated Doris Day’s formula for On Moonlight Bay and By The Light Of The Silvery Moon. These revolved around similar period of American history. There must have been a fifties consensus that life in the nineties was simpler (if not preferable). Will we look back on any decade of the twentieth century with as much nostalgia? For a while, it seemed the sixties would reclaim us. American Graffiti ushered in 70's longing for drive-ins and sock hops, but that era seems now like ancient history (as do the seventies themselves). Why would movies embrace the nineteenth century again? Might as well revisit lives of the pharaohs , and that is all a more reason to treasure The Happy Years. We are not going to get pictures the likes of this again. People who could mount them are gone and they did not leave instructions behind. The early days of nuclear weaponry... possible war with the USSR and China... real war with Korea... juvenile deliquency... yeah, I can understand why there'd be nostalgia for a time when it appeared the only problems concerned shoveling up after the horse-drawn carriages. One's memories tend to focus only on the good. My kid's almost 11 and I know she'll look back at the good old days of the early 21st century. Hi, John -- I think the entire industry was jumping on the "turn of the century" bandwagon. America had reached the half-century mark and was looking back nostalgically at the century's beginnings. Fox had "Cheaper by the Dozen," Allied Artists had "There's a Girl in My Heart," Warners had the Robert Youngson compilation feature "Fifty Years Before Your Eyes." M-G-M's contender seems to have been "The Happy Years," and without major Metro names for the marquee, it may have been greeted as just another period picture in a season filled with them. The Adventures Of Young Dink Stover. I just wanted to say "Leo G. Carroll". You've got pictures of him all over the current entry, and yet he's not mentioned in the text or on the posters. 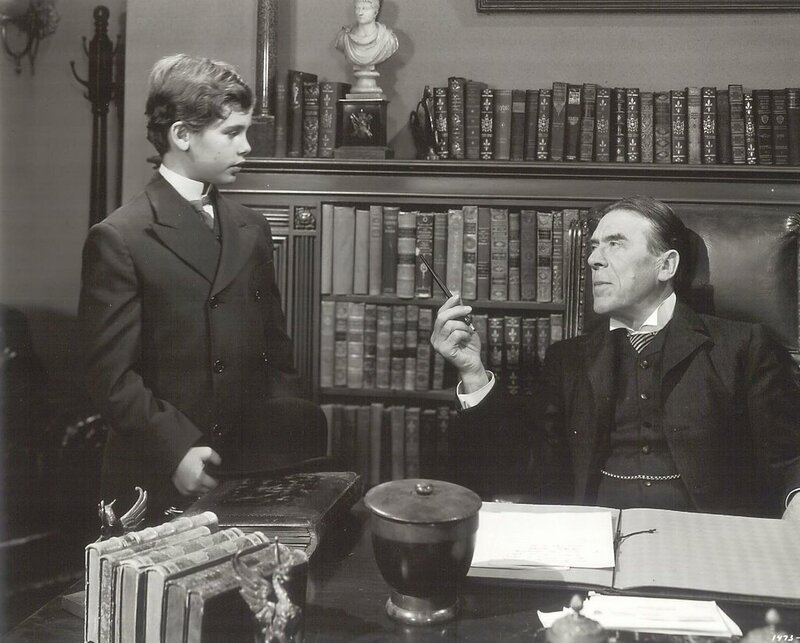 So....Leo G. Carroll. That's all! I too enjoy watching THE HAPPY YEARS...and in fact, the Lawrenceville School ended up making a major impact on Hollywood, thanks to a member of the class of 1960, one Michael Eisner--the man who turned Disney from an institution into a titan. The small screen also has Lawrenceville to thank for Brandon Tartikoff, class of '62. During his tenure one of the resident faculty had a young daughter who was the campus mascot...Punky Brewster. Tartikoff paid her for the right to use her name for the title/lead character of the series he put on NBC (and the lead character's pet dog was named Brandon). Even pop music has a Lawrenceville grad's contribution...Hugh Anthony Cregg III '67, better known to the world as Huey Lewis. Paul, this is wonderful information! Thanks so much for supplying it, along with your insightful comments on other Greenbriar archive posts. Howdy, my mother was working as a secretary in Lawrenceville, N.J. during the time of production and took a picture of Stockwell sitting in some kind of horse-drawn buggy. If you like I can scan it and send it to you. I really love this film and glad that Warner Archive released in on DVD. I know a lot of William Wellman fans don't care for it, but for me it's highly enjoyable. 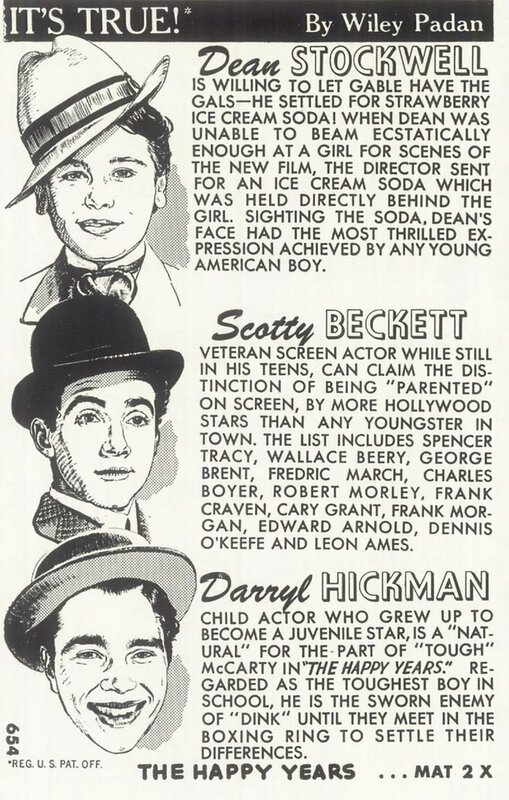 All three leads are very talented and entertaining, and it's sad that Scotty Beckett met such a tragic end, one of those child actors who undoubtedly never recovered from the exploitation and abuse that many young performers were subjected to. It's a shame that he became so self-destructive as he was very talented. Dean Stockwell has had an amazing career, and I love that he's still acting today. Darryl Hickman has also done very well for himself, as has his brother Dwayne (who by the way, plays one of the boys in the sequence where Dink returns home and he and his friends pull pranks on neighborhood girls). 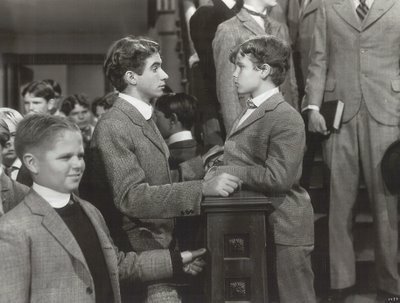 I have heard that Dean Stockwell has named this movie as one of his favorites of his childhood acting career, as it was a comedy and light-hearted and didn't require him to cry. Great post with lots of photos and info! Thanks very much for your comments on this post that dates back --- wow --- nine years. Glad to know the old Greenbriar articles are still being enjoyed.